Mr Rooter Tip Of The Day: Start by pulling out the kitchen faucet sprayer, unscrewing it from its hose, and setting it on the counter. All-metal higher-quality sprayers may be put together differently from their plastic counterparts. Typically, the spacer and seal will be replaced with an O-ring. Cleaning or changing the sprayer requires removing it, which is quite simple when you follow the tips provided by the northeast Ohio plumbing and drain experts, Mr Rooter Youngstown. Tip #1 Note the top and bottom separation line of the sprayer; this is where it comes apart. To disassemble, start by unscrewing the top from the base. Hold the bottom and twist the top toward you. Lay the top aside and pull loose the gasket and spacer. Tip #2 Note the gasket is on top. Tip #3 A U-shaped retaining ring holds the bottom half of the sprayer tight on the hose. Tip #4 Remove it by snapping it off to the side with the point of a sturdy knife or a miniature screwdriver (don’t cut yourself and don’t lose the retaining ring). PRO TIP: Always push away from you when using a sharp tool – even a small screwdriver can puncture and the wound may not need stitches, but can be very painful. In a split second, the tool you are using can slip off of the object you are prying and in most cases the effort you are exerting will be enough to plunge the end deep into your palm. Tip #5 Remove the collar from the hose. Tip #6 Then soak all the kitchen faucet sprayer parts in hot vinegar for up to 1 hour to dissolve any lime on the parts or in the spray holes of the head. When you reassemble the parts, be sure the gasket ends up on top, not the spacer. TRADE SECRET: There are some high-quality alternatives, as well as some whimsical styles. If the point is to add some character to your kitchen then whimsy might be a fresh choice. If the sprayer is used as a tool and gets a considerable amount of use (wear and tear), then choose something sturdy. All-metal higher-quality kitchen faucet sprayers may be put together differently from their plastic counterparts. Typically, the spacer and seal will be replaced with an O-ring. Their basic disassembly and cleaning are the same as for plastic sprayers. Brass fixtures would be considered the most durable and although polishing is necessary to keep them sparkling; add class, value and sophistication to your kitchen. 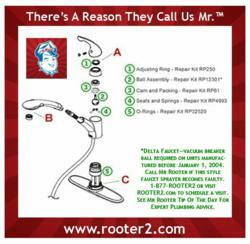 Mr. Rooter is a plumbing specialist in the Youngstown greater area that understands the importance of not only skilled work, but also creating a relationship with their clients. The company lives and practices a Code of Values that emanate from respect, integrity, customer focus, and having fun. Treating others with the respect they deserve, listening with the intent to understand what is being said, and acknowledging the importance of the words in accordance with the speaker are just as important as fixing the leak, or addressing any issue involving plumbing. With a strong focus on customer loyalty, Mr. Rooter knows that integrity means doing a job well, and maintaining the clients trust at the same time. For more information, please visit http://www.rooter2.com.